I start the season by getting my tree up early. I polled a handful of friends to see when they put up their trees. It seems equally divided between those who decorate right after Thanksgiving, those who do wait for the night before Christmas. I like to enjoy it as long as possible. A lit live tree transforms a home and I like this attitude adjustment. Decorating a tree is a personal matter. If you’re newly married, or just setting up your first home you probably haven’t collected a box full of wonderfully meaningful ornaments. Don’t despair. There is nothing quite so beautiful as a tree covered with hundreds of tiny clear lights. This is the perfect solution for those with a bent toward minimalism. 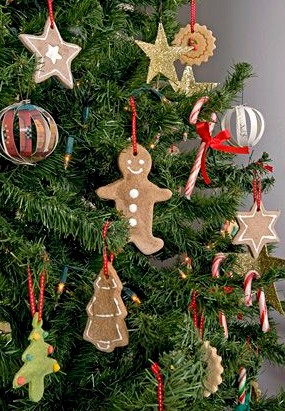 Gingerbread men and stars are easy to make in multiples to cover a tree. Combine and mix together: 4 cups all purpose flour, 1-1/2 cups water and 1 cup of salt. Roll out the dough on a floured surface. 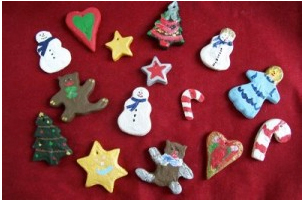 Cut into different shapes using stars, trees, Santas, Gingerbread men with cookie cutters. Make a hole in the top of each for hanging. Let cool and then paint with poster or tube paint. Dry and spray with clear acrylic on both sides. Thread hole with ribbon or yarn for hanging. Tie bunches of cinnamon sticks here and there on the branches as well. This will give the room a holiday scent. Choose a color scheme for your ribbons and tie each ornament to the branches of the tree. Wherever the tree looks bare, tie ribbon bows. Or, for a country cottage look, cut strips of calico to use for tying the ornaments and for making bows. You can make the tree as sophisticated (gold and silver ribbons) or as colorful (lots of different prints) or as country (red and white plaids) as you want. Wrap the base of the tree with fabric, cotton quilt batting to look like a blanket of snow, a pretty quilt or silver foil (works in a pinch). My theme is usually gold and silver balls with clear lights so, at this moment I’m planning to wrap the base of my tree with gold Mylar, unless the batting looks better. I have a red and white patchwork quilt I might use as a tree skirt. A soft flannel baby blanket is a nice alternative. 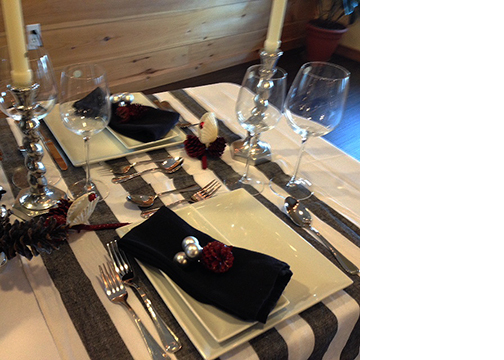 To make a tree skirt to go with the “cookie” ornament theme, use a plain piece of white fabric like an old sheet. When painting the ornaments, before the paint dries use each one as a stamp and press onto the sheet fabric. You can do this with each cutout, placing the images at random over the fabric. You might have to add a little more paint to each ornament after doing this, or leave as is for a “faded” look. In the coming weeks I’ll have more DIY ideas for decorations and gifts that are fun, easy and inexpensive to make.